Here we explain how to configure your webcam, your computer and your RightBooth settings in order to give you the greatest possibility of achieving satisfactory video recordings using your equipment. The general approach you should take is to start recording videos at a fairly low resolution, check the results and then gradually increase the video settings until you find the limits of your equipment. It is fair to say that using a newer, faster computer with a good graphics card and a fast, uncluttered hard disk will provide better recording results than older, slower equipment. As Logitech webcams tend to be the most commonly used make of webcam among our customers, this article concentrates on Logitech. But much of the information presented below is common to all webcams. Ensure you have good quality, even lighting in the region directly in front of your webcam. This is very important as you will be turning off any automatic light and gain settings (see later). Variable lighting can cause problems with webcam focusing and exposure and this can lead to reduced video recording performance. Try to ensure no other programs are running on your computer such as web browsers or wordprocessors. If you are not going to be using RightBooth for emailing or uploading files to the Internet then we recommend you disconnect your computer from your Internet connection. For example: unplug any network cables and also disable the wireless connectivity on your computer. This will avoid the risk of any automatic system (and software) updates occurring while using RightBooth. Temporarily close any virus protection software. Again, virus checkers can slow down video recording performance especially if they start performing background tasks during the recording. On the Start Screen click the Settings button. Select your Webcam. In our example it's the Logitech C920. 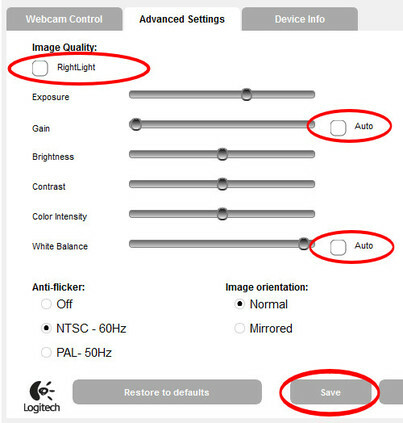 Then click the Webcam settings button to open the Logitech Webcam Configuration program. 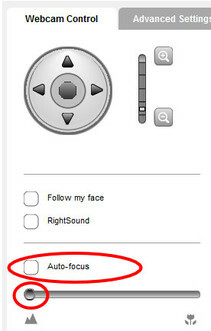 Ensure the focus slider is fully to the left (landscape focus). ​This will ensure that fixed focusing is achieved across the full depth of field of your webcam lens. This will help improve the performance of the video recording by reducing the changes between each video frame that might be caused by the camera lens re-focusing. 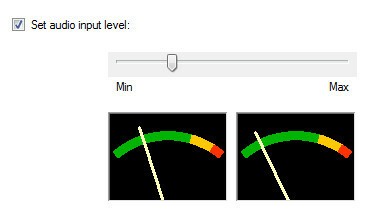 Again, this will help to improve recording performance by reducing the changes between video frames. ​Note that some of the settings mentioned in Steps 3 and 4 may not be applicable to your webcam. Select your microphone. 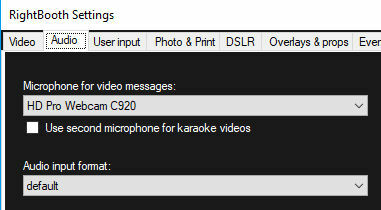 In our example we've chosen the microphone that is integrated in the Logitech C920 webcam. Whether you are using the webcam's internal microphone or another external microphone for recording audio, we recommend that you test and set the audio input level when at your venue location, and prior to your guests recording any video. Tick the 'Set audio input level' check box. You are now ready to try a number of video configurations to see which will generate the best video recordings for you. We recommend you try recording a number of video files using each one of the configurations described next. This configuration will create good quality video with small file sizes. Click the Video Recording Tester and record some test video files. increasing the webcam video size, trying a test recording each time you change it. increasing the recording frame rate to 20, 25 or 30. Using Configuration 2 some webcams will record video using the H264 MPEG data format. This format produces exceptional quality video at very small file sizes, without placing great demands on your computer processor. This means that you can achieve fluent 1920 x 1080 HD recordings at 30 frames per second on most computer equipment. Using Configuration 2 the Logitech C920 webcam should automatically provide this recording format under Windows Vista and Windows 7. Now run a RightBooth Video event and record a video file. If you see the following line: 'recording subtype: H264', then your webcam is recording data in the H264 format. Also set the Data type property to MJPG if your webcam provides it. The Logitech C920 and the Creative Live Cam both provide this. This configuration will create very good quality video with fairly small file sizes. Also, by setting the Data type to MJPG you are instructing the webcam to perform some compression of the video data before it is transferred to the PC. In RightBooth Video settings, tick the option: 'Faster screen updates'. This will reduce the screen processing required while videos are being recorded. Please note that this setting has some implications for the design of your 'Record video' screen in your event files. Please refer to the RightBooth User Manual for more information on the use of this setting. See our FAQ for a list of other things you can check on your computer that might help improve recording performance. We hope this information helps you to achieve satisfactory video recording results using RightBooth.